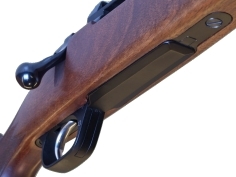 M98 Magazine - Upgrade for Large Ring M98 models and the VOERE 2155/65. Will fit all Standard length Large-Ring Actions like K98. "When hunting in groups, the rifle should not be carried loaded. Also it shall not be transported loaded, hence a detachable Magazine is not only a practical acessory, but a necessity." You can convert any rifle that is based on a Large-ring M98 action. Available for the standard and Magnum systems up to 300 Win. Mag. - see calibre list. Gunsmith installation- A cut in the stock has to be milled in order to accept the Magazine catch. fast up to 300 Win. Mag. 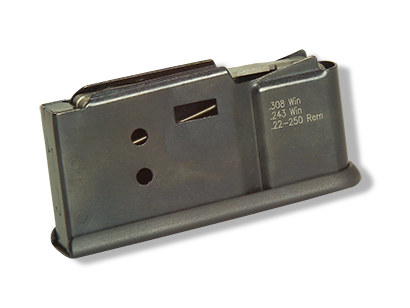 With a hinged floorplate magazine upgrade you can unload your rifle easily and safe from below, as you don't need to eject the cartridges one by one any longer. 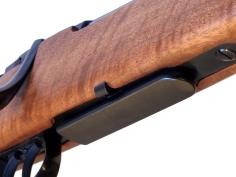 A VOERE hinged floorplate upgrade will give your M98 the desired classic look. 6,5x 57 9,3x 62 270 Win. 7 mm Rem. Mag. 7x 64 22-250 Rem. 30-06 300 Win. Mag.